On theism, and Christian theism we would expect the world to be structured and disposed so that God would have almost unlimited freedom to bring about any effect in the physical world (resurrect the dead, turn water into wine, change the constants and quantities and initial conditions of the universe to bring about a transformed creation, and the like) in as many modes as possible: interventionist, non-interventionist, episodic, and continuously. On some of the most widely accepted interpretations of quantum mechanics today, this is exactly the world we live in. On certain other interpretations God's actions in the world are limited to varying degrees and even metaphysically impossible (et al Alexander Bird). So, we have strong reasons on theism to expect the world to set up in manner that allows for robust divine action, reasons that we don't have on naturalism. See the article below for the details. One would simply have to add in some kind of structural realism to keep what matters from quantum mechanics if it turns out to be false in certain ways in the future. Side Note: The logical structure of this argument seems very apt to accomodate a moral argument for the existence of God from necessary moral truths as well. 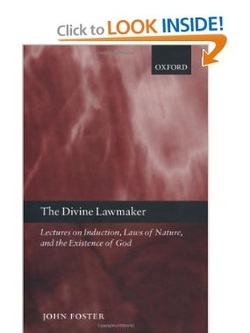 John Foster presents a clear and powerful discussion of a range of topics relating to our understanding of the universe: induction, laws of nature, and the existence of God. He begins by developing a solution to the problem of induction - a solution that involves the postulation of laws of nature, as forms of natural necessity. He then offers a radically new account of the nature of such laws and the distinctive kind of necessity they involve. Finally, he uses this account as the basis for an argument for the existence of God as the creator of the laws and the universe they govern. The Divine Lawmaker is bold and original in its approach, and rich in argument. Taken from apologetics315.com: Today's interview is with Robin Collins, professor of philosophy at Messiah College. His training is in physics and in philosophy and he is a leading advocate for using the fine-tuning of the universe as a design argument for theism. He talks about his background and training, the fine-tuning argument, the different types of fine-tuning with examples and illustrations (laws, constants and initial conditions), two different ways of presenting the fine-tuning argument, answering common objections to the argument, the uniqueness of life, variations of the multiverse hypothesis, the failure of multiverse theory to explain away fine-tuning, objections to Victor Stenger, upcoming books, simplifying the fine-tuning argument for practical use, common mistakes when presenting the argument, the most common objection (who designed God? ), and more.